The Fairmont Miramar Hotel & Bungalows is an enchanting destination for visitors looking to get away from life’s daily hustles and enjoy a surreal vacation. From the second you set foot at the hotel, you can already tell that this destination offers a charming getaway. The well-tended lawns cohere magically with the subtle opulence of the suites, leading up to an incredibly exciting experience. The hotel’s physical location is on 101 Wilshire Blvd. The exact address to enjoy this and more is 101 Wilshire Boulevard, Santa Monica, California 90401, USA. The premium hotel is surrounded by some of the most stunning attractions in Santa Monica. The hotel overlooks the majestic Pacific Ocean, creating the perfect location for a host of water activities. These activities include surfing, fishing, arcade games by the beach and exploring the diverse coastline. One of the area’s most fascinating attractions is the fun-packed Pacific Park that offers great entertainment all year long. This is fun for the kids, for whom there is no shortage of activities to indulge in. Whether it is the whizzing roller coasters, or the dashing number of sweet treats for the sweet toothed individuals, there is something for everyone. More intriguing is the discovery that the Ferris wheel at this park is the only solar-powered structure of its kind globally. From this wheel, you can catch breathtaking views of the ocean well above the pier. The Heal the Bay Santa Monica Pier Aquarium is a kid-friendly attraction that seeks to give insight into the area’s marine life. Local volunteers are at hand to address any questions that visitors may have. Other attractions near The Fairmont Miramar Hotel & Bungalows include the Annenberg Community Beach House, and Perry’s at the beach. Retreating to the hotel’s rooms and suites is a welcome experience, and overall an amazing way to unwind. Since its inception, this Fairmont Hotel has sought to surpass visitors’ expectations, and this is exactly what the professional service is all about. Visit the FIG restaurant to enjoy a carefully cooked meal, plated to your wildest expectations. Little wonder the Super Chef describes the culinary situation as one that constitutes ‘super ingredients, masterfully executed’. The hotel is also the perfect destination for your fairy Santa Monica wedding, whether you desire an elegant ballroom affair, or are content with a picturesque beach wedding. Look up the hotel’s list of wedding services for a precise description of available wedding services. Make your way to the lobby bar where you can catch up with your friends over cold beer, or proceed to the spa for a relaxed massage with the girls ahead of your bridal shower. The heated outdoor pool is a picture-perfect location for a photo-shoot (with prior arrangement), and certainly for a dip to cool off the summer heat. If you love to stay fit, you will enjoy working out at the fully equipped exercise room. Business travellers are not left out with the creation of the business center that provides internet access among other office services. 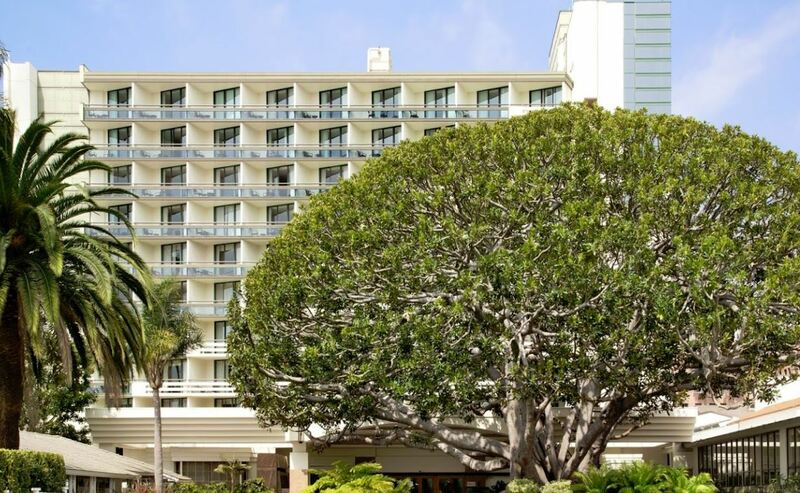 The Fairmont Miramar is home to swanky and exclusive rooms and suites to ensure you have an amazing stay. The 302 executive guest rooms across the magnificent ten-story tower provide a memorable experience peppered with panoramic views of the ocean. Whether you would prefer the intimate garden bungalows, or prefer the premium rooms with patios, the choice is yours. The Fairmont Miramar Hotel & Bungalows is a magnificent 4-star hotel that conjures up images of fine living, exotic holidays and overall, beautiful memories of Santa Monica.